Over the last few days, the Obama administration has conveyed far-from-conclusive statements about the use of chemical weapons in Syria. When one hears phrases like "with varying degrees of confidence," it's quite a stretch to regard anything as certain. And yet it doesn't stop many on the right -- including more than few right-leaning friends of mine -- from directing criticism at Obama, claiming he had a "red line" which appears to have been crossed, so what is he waiting for? It's another chance for them to hopefully cast him as a wobbly Democrat when it comes to making difficult decisions about going to war or intervening militarily in another country. As always, Obama's no dope. He remembers all too well what happened when the prior administration acted on very inconclusive intel about WMD. He's definitely not going to make that same mistake. However, suppose the intel is 90% or 95% on-the-mark, that it's very likely Syria did indeed use chemical weapons, but yet it's not 99.9% ironclad. Will Obama delay in favor of getting a near-100% certain answer from intelligence sources? And what if his desire for certitude ends up taking a prolonged amount of time during which something awful happens? And will such intel ever be 99.9% conclusive, and at what point should a president just act? I believe these are all valid points and questions, and I don't claim to have the definitive answers. However, I would remind those on the right that if you want to blame anyone at a time like this, start with your boys Bush/Cheney. It was their bungling of intel in the lead up to Iraq (leaving aside how much was cooked or fabricated at the time) that has forever affected how future presidents will decide to act under similar circumstances. Can anyone blame Obama if he were to hesitate, even slightly, given recollections of the Bush/Cheney years? Would he even want to risk being cast in the same light as Bush/Cheney if the Syrian intel turned out to be wrong? Some may say that the extremely regretful past of Bush/Cheney has managed to at least create lemonade from lemons in that if anything it insures that future presidents will take inordinate steps to insure all intel is accurate. I would argue that Bush/Cheney were the exceptions, that most if not all prior administrations did take the necessary time and effort to insure that intelligence was solid and actionable. The mistakes and chicanery committed by GW's administration does not improve the chances that intel will be more accurate. The protocols, routines and systems in place likely remain now as they were then. In fact, arguments can be made that overall the intelligence community performed very well during the Bush years, and that the failures came from higher-ups within the administration and not so much within the "nuts and bolts" of the intel apparatus. But a lasting harm of Bush/Cheney is for any president to refrain from acting on intel due to excessive fears of it being faulty. Yet no intel will ever be 100% certain and such hesitancy to act could eventually cost lives. Make no mistake, and I hope it's obvious, I'm not making the case that Obama should rush to judgment and take action versus Syria. Rather I'm simply making the case that these kinds of decisions are not and never have been easy, and yet thanks to the shameful legacy of GW/Cheney, it has only been made a much more difficult process for all future presidents for all the wrong reasons. In this time of Bush reconsideration, one should remember the many horrible truths of his eight years in office. To this day we continue to be adversely affected by his incompetent reign. Obama Proposes $900 Billion Surplus! Huh? Obama proposes a surplus? 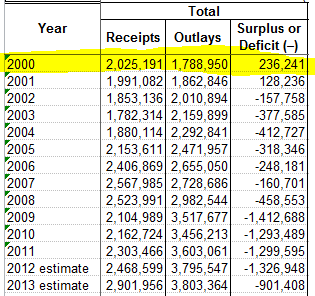 Note the $200+ billion Clinton surplus (in yellow), which Bush/Cheney quickly turned into years of deficits. Also note that despite the year after year of deficits under Bush/Cheney, we never heard a peep from the Tea Party and/or Republicans. As a rule, deficits only matter when a "D" resides in the White House. As you can see, the (inherited) deficit has come down under Obama by -35% ($1.4 trillion to $900 billion), one of if not the biggest and fastest deficit reductions ever, in our history. Yet, just as we never heard boo from the Tea Party/Republicans about the deficits during Bush/Cheney's reign, we never hear boo about the fact that the deficit has been declining since 2009. For that matter, just as we never hear much about how the stock market has more than doubled with a pinko socialist as President. So this past week Obama proposed a $1.8 trillion deficit reduction package. Given the deficit is projected to be $900 billion by the end of this year, judging by my math, in effect he's proposing a plan to achieve a sizable ($900 billion) surplus. Let's please stop using "balance the budget" or "erase the deficit" and start using that "S" word more -- it has a huge impact on the public and always harkens back to the last time we had a surplus, the Clinton years. Ah yes, when times were better. But again, we never hear a peep about any of this.... Oh, that liberal media.